Fugitive Shawn Christy was captured in Mansfield, Ohio earlier today. Christy, who spent around a week in Adair County last month, was taken into custody around 4:38 p.m. Eastern Time near where he wrecked a vehicle Sunday. “He is no longer on the street; he is no longer a threat to the Mansfield community,” said Ann Murphy, of the U.S. Marshal’s service. Murphy took part in a press conference at the Ohio State Highway Patrol post in Mansfield. 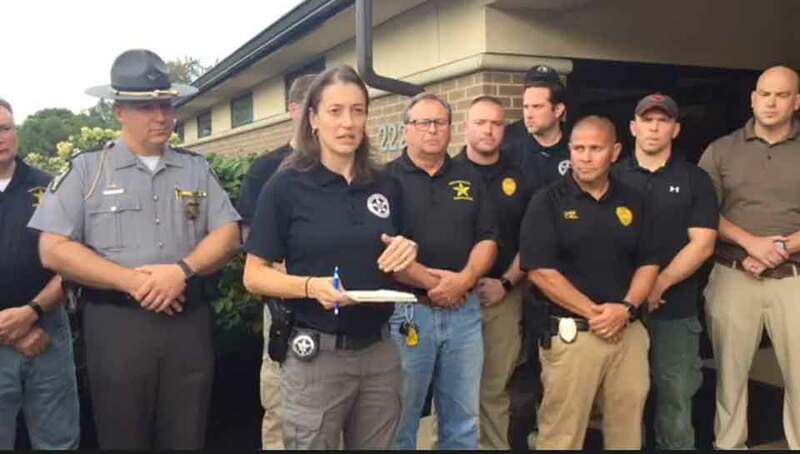 She credited a long list of law enforcement agencies that had taken part in the hunt for Christy since Sunday. Murphy said the hunt had continued since Christy wrecked a vehicle Sunday afternoon. Teams worked 24 hours a day and they worked on dozens of tips from the community, searching woods, fields and campsites, she said. Law enforcement found Christy hiding in a ravine. He was arrested without incident but did have a gun and a knife on him. He was taken into custody and at some point will be transferred to Pennsylvania, Murphy said. Christy was believed to be in Adair County for about a week in August before breaking into a house on Aug. 9 that is owned by Medal of Honor recipient Dakota Meyer. Christy was believed to be in the area searching for Meyer, who also owns a home in Texas and was not in the area during the time of the breakin. Christy, 27, of Pennsyvania, has made threats against President Donald Trump and a Pennsylvania district attorney. His obsession with Meyer apparently has to do with Meyer’s former mother-in-law, Sarah Palin. Palin, a former vice presidential candidate, filed a protection order against Christy in 2010. According to an article from Newsweek, Christy and his father spent time in prison on charges of harassing Palin’s attorneys. Christy apparently stole a vehicle from Meyer’s house on Aug. 9 and used it to drive to West Virginia, where he stole another vehicle and was later spotted in Maryland. Federal agents believe he stole a pickup truck in Pennsylvania this past Sunday. He apparently crashed the vehicle on Interstate 71 near Mansfield, Ohio later the same day, prompting local schools to close Monday and Tuesday during a manhunt, according to an online article from the Mansfield News Journal. A federal warrant was issued for Christy on June 19 in relation to Facebook threats against President Trump and an attorney.